Hanna Gronkiewicz-Waltz said security must come first and Warsaw had suffered enough from “aggressive nationalism”. A year ago, 60,000 people took part in the nationalist march, amid chants of “Pure Poland, white Poland”. Some of the organisers have threatened to go ahead with the march regardless. The mayor’s decision can be challenged in court within 24 hours, the BBC Adam Easton in Warsaw reports. Poland’s conservative government had already failed to persuade organisers to carry only national flags. 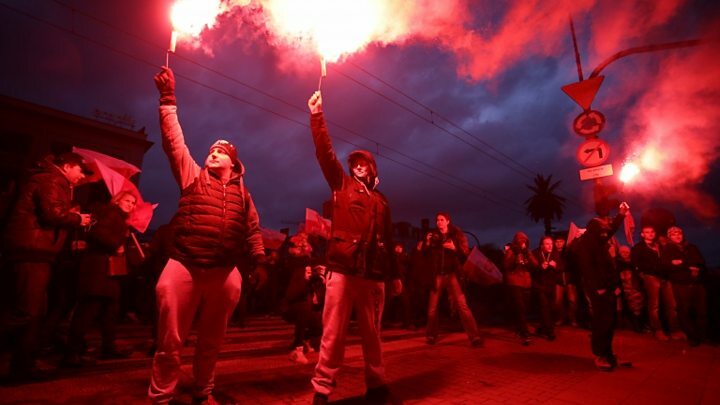 Polish President Andrzej Duda said he would now organise and take part in an official march. “Everyone is invited, come only with red-and-white flags,” he said on Twitter. Although the event is popular with thousands of ordinary, patriotic Poles, including supporters of the ruling Law and Justice (PiS) party, it is partly organised by the far-right National Radical Camp (ONR). In the past two years it has attracted more than 50,000 people. Sunday’s march was expected to be far bigger. Among the Polish flags last year were smoke bombs, along with racist and anti-Semitic chants and banners. Some of the marchers were far-right agitators from countries including the UK and Italy. A smaller counter-protest attracted some 2,000 people. The march was cited in a European Parliament resolution last month, which called for a ban on neo-fascist and neo-Nazi groups. President Duda and Prime Minister Mateusz Morawiecki had originally said they planned to take part in Sunday’s 100th anniversary march but decided not to, because the organisers could not guarantee that offensive banners would not appear, our correspondent says. The mayor of Warsaw, a member of the opposition Civic Platform party, explained that security was a concern on Sunday and her appeals to the government for help had fallen on deaf ears. Strike action by police would also make it difficult to secure the event properly, she said, and Warsaw had suffered historically from aggressive nationalism under German occupation. “Poland’s 100th anniversary of independence shouldn’t look like this, hence my decision to forbid it,” she said. Poland’s second republic was established on 11 November 1918 at the end of World War One, after more than a century of rule by Prussia, the Austro-Hungarian empire and Russia. Ms Gronkiewicz-Waltz also complained that no charges had been brought against people who had broken laws at last year’s march.